Ken `Spider` Sinnaeve is a well known and respected bassist who lives in Winnipeg, Canada. A seasoned road warrior, his credits as a band member and sideman include some of the ultimate Canadian and international recordings with Streetheart, Tom Cochrane, The Guess Who, Kim Mitchell, Doc Walker and now Loverboy. Spider has done numerous TV, Film and radio recordings and does frequent studio work in Winnipeg. He is also a songwriter and co-produced and wrote songs on several Streetheart recordings. 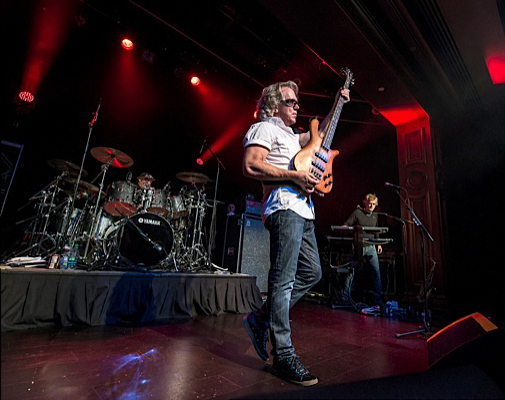 Ken has won numerous awards for his playing including 2 Juno awards (Canadian Grammy’s) and the Technics award for Bass player of the year, as well as two Western Canadian Music Hall of Fame inductions with legendary Canadian bands Streetheart and Loverboy. He has recorded with renowned musicians including drummers Anton Fig (David Letterman Band) and Mickey Curry (Hall and Oates, Bryan Adams), and also written columns on bass playing for the magazines Music Express and Canadian Musician. In 1994, he was interviewed by Peter Murray for a feature article in Canadian Musician Magazine. Ken also plays locally with various bands, but every Sunday night has him at the King’s Head Pub playing with All the King’s Men, a blistering rock fusion band that has a strong following with their own original material and classic covers. I am available to record on your music projects. I am willing to travel to record at your studio or I can record my portion of the bass tracks at a local studio here in my hometown and get these out to you. I can also send and receive files to record via email.